Garda, or sometimes Garda Town to avoid confusion, was the 10th Century fishing village which gave Lake Garda its name. Built on a scoop of shingle, today the bay is just as charming, but the town is pierced by the busy road around the lake so it can be quite busy in summer, and the best places to stay in Garda tend to be just out of town away from the traffic. 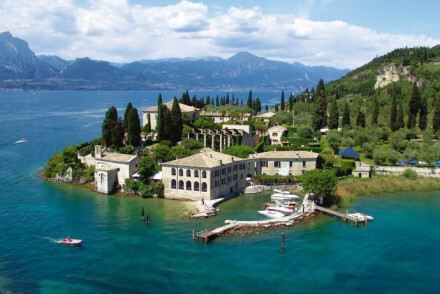 If you stay in Garda it’s definitely worth taking a boat out to nearby Isola del Garda, a stunning private island with an impressive Gothic villa and beautiful formal gardens. The boat from Garda leaves on Wednesday morning. Just remember to get organised and book early. The best places to stay in Garda are very busy during the peak summer months. The Locanda San Vigilio is an elegant, 14 room hotel owned and run by an Italian count! It’s been a hotel for 500 years and it’s immaculately decorated with antiques and beautiful objets. The hotel even has it’s own Emporium where you can buy beautiful things. Located in a lovely hillside spot above Garda, the Tobago Wellness Hotel is ideal if you appreciate good spa facilities. Here you can expect a Turkish bath, Kneipp hydrotherapy, a Finnish sauna and much more. Plus there's great views, lovely outdoor pool and restaurant. Relais Rossar is the one to book, if you don't want to spend a fortune but do want a stylish place to stay. It's perfect for outdoorsy types too - there's great storage facilities for bikes etc, and families are welcome. Prati Palai offers eight luxury suites and one double room in a beautiful rural spot with stunning views over Lake Garda. Come here for a spoiling break away from the crowds. The B&B Corte Castello is a delightful. three room, rural hotel with rustic charm and traditional interiors: think antiques and elegant details. You’re surrounded by vineyards. 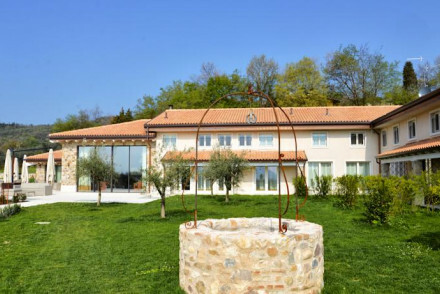 Corte delle Cicale is a traditional Italian villa surrounded by vines and olive trees. Rooms are romantically furnished and you can enjoy stunning views from this hillside hideaway. Relais Colle San Giorgio offers excellent value for money. Smart rooms start from as little as €95 per night B&B. Plus you'll enjoy wonderful views and there's a lovely pool for cooling off. Prefer an Apartment or a Villa? Garda is on the south-eastern shore of Lake Garda, positioned between several international airports: Verona-Villafranca and Brescia-Montichiari. It’s also about 100kms from Venice Marco Polo airport and from Milan’s Linate and Malpensa. The nearest railway station is Peschiera, 15kms away, but you’re only around 30kms from Verona. If you’re thinking about hiring a car we recommend checking what our online partners, Rentalcars have to offer. Lake Garda has always been an extremely desirable holiday destination, so if you're planning to visit in the high season you should expect full hotels and reservations required for the most popular restaurants - but this is the place to see and be seen, and the bustle is part of the shining appeal. Even if you're not hoping to visit in peak season it's still advisable to book the best places to stay in Garda several months in advance - and even then charm and diplomacy may be required. Best time to visit - To avoid the crowds and searing heat, plan your visit in May, June or September when the average daily high is around 22-26 degrees celcius. or maybe the best hotels with a view on Lake Garda? or the best family hotels on Lake Garda? A hot spot for bikers, groups and families - this secluded villa has a comfortable and friendly atmosphere. The peaceful countryside and large garden provide the perfect place to unwind. Bedrooms are spacious and homely- some spread over two floors. Helpful staff can organise excursions. Offering guests a large outdoor pool with sun terrace and an extensive spa facilities. Bedrooms are fitted with contemporary furniture and stylish modern features. All have glorious views of the surrounding lake and hills. Enjoy fresh fish and Italian classics at Tobago's restaurant. Elegant and intimate lakeside hotel, full of character, owned and run by an Italian count. A hotel for 500 years, the property is right on the waterside in a charming location, full of antiques and objets. A very special and relaxed place to stay. Local markets - The hotel has its own Emporium where you can buy prints of drawings by Venetian artists, painted ceramics and fabrics. Great walks - Wander along the Cypress shaded avenue to the Parco Baia delle Sirene. Sailing - Charter a boat for hire from Lega Navale, just 2 km down the road.